Over the course of the last three months, four candidates running for Norfolk City Council for Ward 1 have been vying for the support and vote of Wards Corner residents in the May 4th election. Many of us have attended several of the candidate forums where the candidates have appeared and discussed the issues. Recently, those of us who live in Ward 1 have started receiving campaign literature from three of the four candidates. We want to set the record straight. The candidates, with the exception of one, have not indicated any real plan to revitalize Wards Corner. Mr. Brewer and Mrs. Saunders tend to dance around that issue without offering any real ideas. Mr. Brewer has repeatedly said, in the forums that we have attended, that putting more police officers and code enforcement inspectors will effect change. We, however, all agree that this approach is merely a temporary band-aid that has been tried over the past 10 years without any substantial results. Let us be very clear. We, as active civic leaders of the Greater Wards Corner Area, support Andy Protogyrou for City Council as the only credible and viable candidate for Ward One. We encourage you to do the same. The other two candidates have only recently positioned Wards Corner as a top priority due to the positive feedback and endorsements that Andy Protogyrou is receiving. Andy Protogyrou lives in the Greater Wards Corner Area, has been a Civic League President, and demonstrates a resume that clearly puts him head and shoulders above the other candidates. He has what it takes to be our advocate and get the job done to revitalize Wards Corner and address the issues of Ward 1. It was us, the undersigned, who approached Andy Protogyrou to run for City Council and NOT the downtown crowd as some have suggested. Andy’s approach to revitalization is based on good business sense, proper economic development strategies, and a clear understanding that a healthy business district drives healthy neighborhoods. More police and code inspectors, although important, don’t effect the necessary change. 5. Improving the quality of life for all. We all believe that Andy Protogyrou possesses those qualities that are required and necessary to revitalize Wards Corner and be an effective advocate on City Council. Several organizations agree, including the: Norfolk Professional Firefighters Local 68, Tidewater Builders Association, Eastern Virginia Labor Federation, AFL-CIO, Hampton Roads Realtors Association and United Black Firefighters. This is perhaps the most important election to date for the citizens of Ward 1. We ask that you join us and vote for Andy Protogyrou. Update: The Virginian-Pilot agrees and has endorsed Andy as well! The City of Norfolk Proposed Operating and Capital Improvement Budget was presented by the City Manager to City Council on April 20. The proposed Budget can be found on the City’s website, here. Provide funds to improve the residential and business areas of Wards Corner consistent with the Neighborhood Plan. Acquisition of blighted property from willing sellers will be pursued based on prioritizing areas in a strategic manner. The current budget (2010) allocated $1,010,000 to the Wards Corner Neighborhood Plan and proposed $1,000,000 for 2011. The 2011 budget proposal now includes $767,500 more than what was proposed in 2010. In addition the budget proposal allocates $135,000 of the $1.5 million that is estimated to be needed to replace or reconfigure the Fitness and Wellness Center’s indoor pool roof, renovate the Men’s locker room and renovate the banquet hall. The intersection of Tidewater Drive and Little Creek Road was, according to the 2010 budget, going to receive $4.8 million in 2011 for reconstruction of the intersection at grade. The new budget proposal only allocates $150,000 towards that reconstruction, with the remainder of the money allocated over the 2012 and 2013 budgets. WCN Meeting Recap: Crosswalks, Planters, Light Rail, etc. Wards Corner Now had a meeting on April 17, 2010 at the Fitness and Wellness Center. As is customary with WCN meetings, the facilitator of the meeting is rotated month-to-month. Dr. Brad Robinson was nice enough to head this meeting. Topics covered were: Mayor Fraim, Blessed Sacrament, DePaul Medical Center, Norfolk Collegiate, Crosswalks, Planters, Light Rail, Upcoming Elections, and the Agenda’s for the May and June meetings. Mayor Fraim was present as were City Council candidates Barbara Saunders and Andy Protogyrou. Below is a short summary, nothing is verbatim. Mayor Paul Fraim: The meeting started with Dr. Robinson recognizing Mayor Fraim and asking him to address those present. The Mayor spoke briefly about his campaign and indicated that he looks forward to things happening soon at Wards Corner. Blessed Sacrament: Jim McDonnell reported that Blessed Sacrament Catholic Church is undergoing a renovation and expansion of its social hall. He expects this to be a nice addition to both the church and our neighborhood. DePaul Medical Center: The representative from DePaul declined to attend or provide any updates at this time as they are still in the conceptual phase. It was reported that charette’s will be held and the surrounding residents will be invited. The possibility of a traffic circle and a “medical campus” design were also reported by some of those present. Norfolk Collegiate: Mr. Kennedy, the headmaster of Norfolk Collegiate, was invited to attend the meeting and provide an update with regards to fundraising and construction of the new Arts center. Unfortunately he had a prior engagement and he plans on being present at the May meeting. 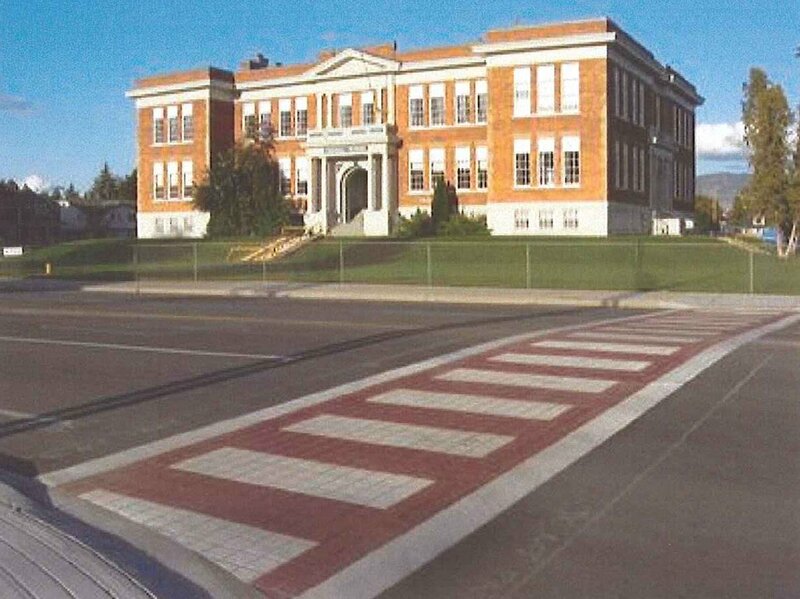 Crosswalks: Louis Eisenberg reported that he was approached by City Traffic Engineer, Guzin Akan, regarding the construction, or reconstruction, of crosswalks in and around the Wards Corner Business District as well as in front of Granby Elementary School. He reported that a proposed crosswalk in front of Granby Elementary included “bump outs” where the road would be narrowed to two lanes. The bumpouts are intended to slow traffic and to create an shorter and safer path for the children to cross. This crosswalk is expected to cost $59,000. In addition, Ms. Akan has identified seven (7) crosswalks in and around the Business District that either need to be added or reconstructed. 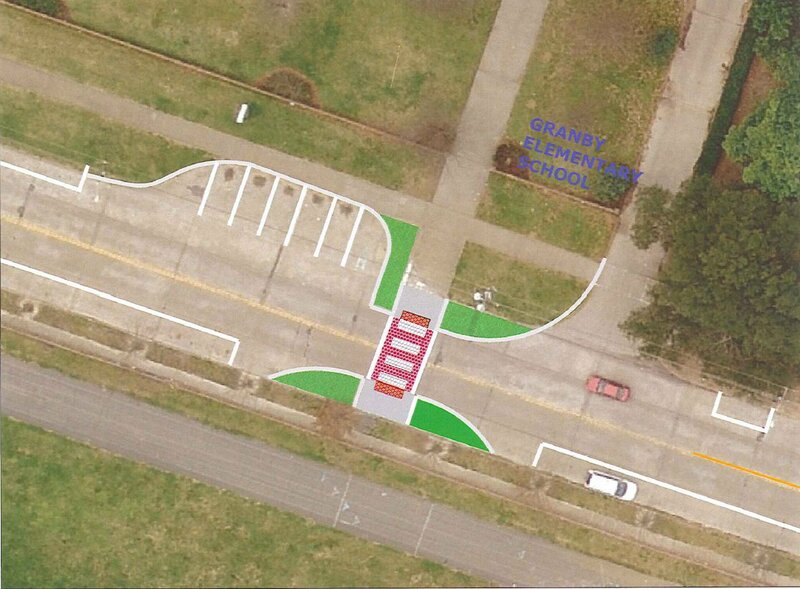 To reconstruct the crosswalks with the up-to-date resin product that would match what is located at the intersection of Granby and Little Creek Rd would cost $30,000 – $50,000 for each crosswalk. The question posed by the City and by those present at the meeting: Should the City spend money on the crosswalks now or later after construction has completed. Some compromised solutions were discussed as well, such as just constructing some of the crosswalks now. Guzin Akan will be at the Taskforce meeting on May 13 to further discuss her proposal. Planters: Joan Griffey offered a report on the planters that have been requested for the Business District. She reported that the holdup is largely caused by the City Manager’s office. She reported that the Mayor has agreed that we should receive the planters and that he does not believe residents should be required to sign a contract and maintain public planters. The City Managers office, on the other had, is adamant that some person or group sign a contract to take care of the plants. Light Rail: Reference was made to the 2009 Hampton Roads Transit proposal running light rail through Wards Corner. Both Barbara Saunders and Andy Protogyrou spoke about running light rail down Granby Street from downtown as a way to boost economic development in Riverview, at the zoo, etc. Andy Protogryou suggested having someone from economic development come talk at the next meeting about the possible routes that light rail may take. Upcoming Elections: Andy Protogryou and Barbara Saunders gave a short speech about their campaigns for City Council. They will both be at the Wards Corner Civic League candidate forum on Monday, April 19, 2010 at the Fitness and Wellness Center at 6:45pm. That will be the last forum scheduled forums for both of their campaigns. May Meeting Agenda: The next councilperson for Ward 1, Representative from DePaul, Representative from Norfolk Collegiate, possible Guzin Akan. June Meeting Agenda: Rick Henn?City Development to talk about Light Rail in Wards Corner. These candidate responses are being provided in three parts. All three questions can be found in the article, Brewer, Protogyrou, and Saunders Questionnaire. We thank the candidates for their willingness to run for office and for the time they took to answer our questions. Question #3: Detail those items in the Wards Corner Comprehensive Plan that you believe are incorrect or need to be changed and explain why you believe so. Chuck Brewer’s Response: I called Mr. Brewer and he stated that he would not participate in this Candidate Questionnaire. Andy Protogyrou’s Response: In examining the Wards Corner comprehensive plan, the greatest problem is its age. At this point the plan is six (6) years old and the actions that have resulted from it have been minimal. I have been a proponent for bike paths from Ocean View down Granby Street. There is a consideration for a bike path along the railroad right-of-way as the railroad tracks go toward Diven Street along Terminal Boulevard and on to NIT. The issue of bike path and bike safety through the Wards Corner corridor must be addressed in a more comprehensive and safe manner. This would include being able to bike from Hampton Boulevard to Wards Corner, and through the Titustown retail district. The development of a hotel in the Texas streets area may prove difficult because of the interstate splitting that area of Wards Corner in two parts and keeping hotel guests away from the greater retail area. We may need to examine the additional use of hotel space with rooms on the west side of Interstate 64 to allow hotel guests to walk from their room into the retail sections of Wards Corner closer to the intersections of Granby and Little Creek Road. The plan itself with the areas of Little Creek Road and Granby Street coming together should have more mid-box retail potential than what is being shown in the actual plan itself. Lastly, a light rail station that links a “transportation hub” (the HRT transfer area) to downtown with light rail traveling along one of Granby Street’s lanes each way would link downtown’s commercial district with that of Wards Corner and then a true and unparalleled transportation link to most of the city’s population. It would allow for growth along the corridor which includes Ocean View, the new DePaul Hospital, Riverview, the Zoo, and 21st Street. The approach of tear down and rebuild rather than reinvent and repurpose what already exists. Even in the best of times, there wasn’t enough money to successfully execute the plan. That is why nothing has happened in the six years since the plan was published. The presumption that Wards Corner can become a mid-box retail destination with merchants such as Best Buy or Old Navy, particularly in the emerging economy we now face. 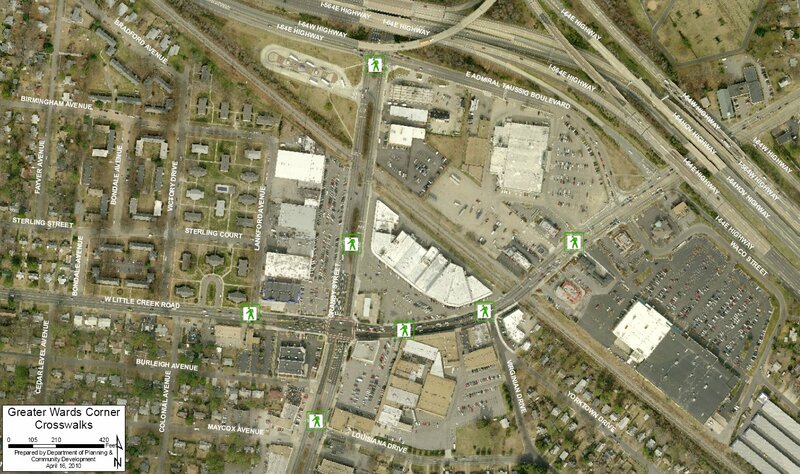 The denial that much of Wards Corner is populated by young families and not meeting their market demands. Almost 55% of Wards Corner’s residents are between the ages of 18 and 49 and 60% of the annual household income for the area is less than $35,000. The national trend of an aging population is not a factor in Wards Corner. Only 25% of the population is currently 45+, a demographic that includes the youngest baby boomer. And given the competition for empty nesters in other redevelopment areas of the city, such as downtown and East Beach, it is unrealistic to think Wards Corner can be a destination for aging Yuppies. The plan does not address, nor does it change the fact that Wards Corner is a place where young families begin. We should embrace their energy and new ideas, not stifle their growth and development, and at the very least, we should stop wishing them away. The importance of the stabilizing neighborhoods, many of which are in Ward 1. These communities are home to older, higher income residents who would contribute to the revitalization of Wards Corner as a shopping destination. Many of these residents may be transitioning to retirement and downsized residences. Ensuring that Greater Wards Corner is a vibrant area that accommodates age diversity will allow the stable neighborhoods to enjoy a natural transition in ownership and the market will provide new housing opportunities for older residents who want to stay in the area. Question #2: Please explain in detail the solutions you intend to utilize to address the issues you identified in question #1, above. Andy Protogyrou’s Response: The solutions to the foregoing issue of marketing for redevelopment on the local, state, national and international level involves the use of the Norfolk Economic Development Authority Office. It is this office that would market the location and the benefits that Wards Corner brings through its position geographically and demographically in the city. This would involve traveling the United States and world to publish what Wards Corner is and what it can be once again. Second, the marketing of Wards corner locally would be more on the scale of what we often see at Merchant’s Square in Williamsburg. How often do any of us watch television or listen to the radio and hear an advertisement for the merchants in the Colonial Capital combined together to bring economic dollars throughout the region to them? Wards Corner can once again be in that position of marketing itself from Titustown to Southern Shopping Center and the Lafayette River to Johnson’s Corner. On a short term, stepped up patrols and code enforcement by Norfolk Police is a solution. A small police substation where officers use bikes and segways out of one of our current storefronts as a base of operation combined with one of the eleven city code enforcement officers allows greater access to the community and our citizens that are most at risk. Also, linking of light rail to downtown from Wards Corner is imperative to our growth. Barbara Saunders’ Response: Norfolk has become a city of plans without action. Whether it is the outdated Norfolk General Plan, the nine area plans listed on the city’s website or the dozens of neighborhood plans collecting dust at city hall, planning has gone from a best municipal practice to a political panacea. Even during prosperous times, when the plan was published, the Wards Corner Plan was based on the following model: Move (mostly poor) people out, tear down what is there, build something new, move new (higher income) people back into new buildings. The solutions can be found in the citizens who make the Wards Corner area their home. Almost 35% of the residents in the Ward Corner area are between the ages of 18 and 24, young adults that comprise the largest segment of the population. The second largest segment (25%) is children under the age of 18 and the third largest segment (24%) is between the ages of 35 and 54. The smallest segment of the Wards Corner population is adults 55+ so we’ve got to stop talking about what Wards Corner used to be or what Wards Corner ought to be and begin to take action on what Wards Corner is. With almost 60% of the residents of Wards Corner comprised of young and middle-aged adults, we need to encourage a creative class of merchants and service providers. Working with ODU, Norfolk State and TCC, the city should facilitate entrepreneurial incentives for graduates of their business programs. Rather than tear down and rebuild, we should recycle and reinvent the strip mall again encouraging new approaches that go beyond the big box and mid-box retailers. We could also renew the exterior appearance such as being done at the corner strip mall located at the intersection of E. Little Creek & Shore Drive. Grime equals Crime and one of the most efficient means of addressing crime, particularly in blighted areas is to start with good housekeeping practices. Collaborative programs between police and citizens are essential. That means a return to community policing. Renewed codes enforcement programs and a zero-tolerance policy for nuance codes infractions, particularly in high-density communities. Perception: Encouraging entrepreneurial investment in Wards Corner and developing programs with existing communities, not a ghost population, will bring about the changes Ward Corner needs and the new, revitalized perception of what is will prevail. Question #1: As you know, Wards Corner Now concerns itself with issues that directly affect the Greater Wards Corner Area. Please list and describe those issues that are, in your opinion, the most pressing issues affecting the Greater Wards Corner Area. Andy Protogyrou’s Response: Wards Corner has been characterized as the Times Square of the south. Like Times Square, which fell from grace and transformed itself, our own Times Square is in the beginning of its own renaissance. Wards Corner is the economic engine of the city of Norfolk and sits at the gateway to the world’s largest naval base. It also provides the first impression of a business corridor when one enters Norfolk from the west. Though the question seeks an answer of plural issues affecting Wards Corner, the main issue that Ward One cannot wait for any longer is prioritizing the redevelopment of the Wards Corner area. Ironically, when one examines the Norfolk Redevelopment website, the Greater Wards Corner Comprehensive Plan is one of the oldest plans that remains on the site. The performance over years involving the fruition of the plan’s vision has been anemic at best. Redevelopment and prioritizing same involves the marketing of the Wards Corner area to local and out-of-town developers, assisting in current business growth and marketing it throughout the Hampton Roads area. In general, the proper marketing for redevelopment assists in expanding the tax base to allow for better schools and creates jobs which reduces crime. Public perception that the problem is too big. 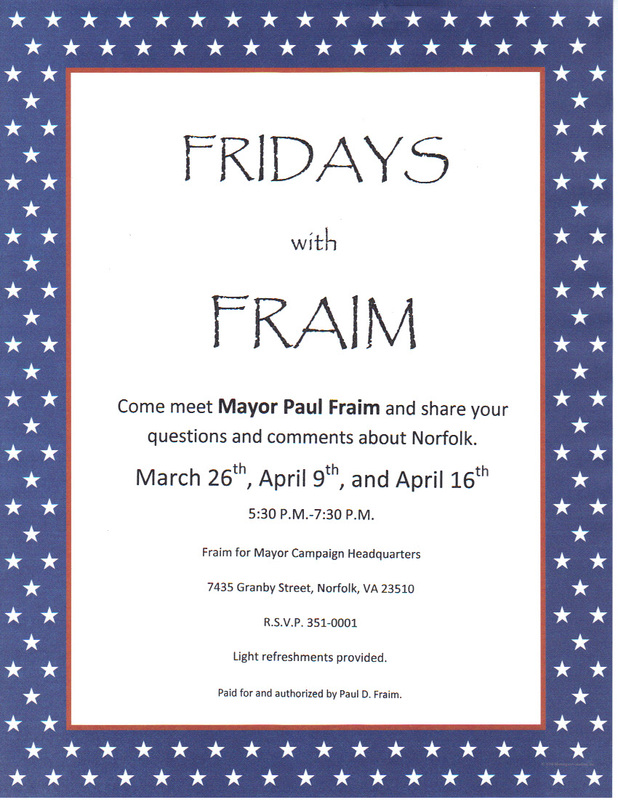 This Friday is the final “Fridays with Fraim” at Mayor Fraim’s campaign headquarters in Wards Corner. Come on over to the Campaign Headquarters to meet and mingle with Mayor Fraim and his campaign team! This is the last Friday with Fraim before the election on May 4th. We encourage you to bring friends and family along to enjoy the refreshments and good company. We look forward to seeing you there! You are currently browsing the Wards Corner Now - Wards Corner, Norfolk, Virginia blog archives for April, 2010.